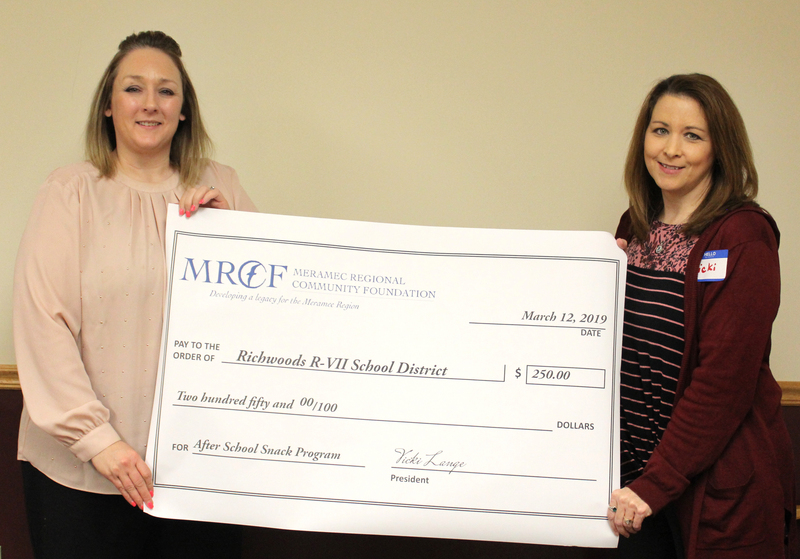 ST. JAMES—Meramec Regional Community Foundation (MRCF) awarded Richwoods R-VII School District a $250 grant for its after-school snack program. The check was presented at MRCF’s invite-a-friend luncheon March 12 at MRPC in St. James. This year, the MRCF board reviewed a total of 18 grant applications, requesting a total of $4,414.21 and representing projects in Crawford, Dent, Maries, Osage, Phelps, Pulaski and Washington counties. Richwoods R-VII, in Washington County, was one of six projects selected for funding. Richwoods R-VII’s primary goal with the MRCF grant funds is provide students with a snack after school so hunger does not prevent them from learning. Four days a week, ten teachers provide tutoring to approximately 70 students to help improve their math and reading skills. These students are at the school until 4:30 on those days, having eaten nothing since lunch. Many times, teachers will use their own money and food to provide snacks. The Bourbon Boosters for ramps for its stage at a local park. MRCF is an outgrowth of the Meramec Regional Planning Commission (MRPC) and is an affiliate of Community Foundation of the Ozarks (CFO) in Springfield. The regional affiliate was formed in 2010. Its 12-member board includes representation from each of the eight Meramec counties and from MRPC. Vicki Lange of Osage County serves as president of MRCF. Currently, MRCF has 54 funds totaling over $2.83 million. CFO is a public foundation serving the Missouri Ozarks. The foundation’s mission is to enhance the quality of life in the region through resource development, community grant-making, collaborations and public leadership. Formed in 1973, CFO has since grown to include 49 affiliate community foundations and more than 3,700 charitable funds totaling approximately $300 million in assets, as of June 30, 2018. MRPC, in addition to establishing the regional foundation and providing the initial investment to create a grant program, provides staff support to MRCF. Formed in 1969, MRPC is a voluntary council of governments serving Crawford, Dent, Gasconade, Maries, Osage, Phelps, Pulaski and Washington counties and their respective cities. Gasconade County Presiding Commissioner Larry Miskel serves as chairman of the board. A professional staff of 25 offers technical assistance and services, such as grant preparation and administration, housing assistance, transportation planning, environmental planning, ordinance codification, business loans and other services to member communities. To keep up with the latest MRPC news and events, visit the MRPC website at www.meramecregion.orgor on Facebook at www.facebook.com/meramecregion/. Cutline: Bethany Deal (left), the superintendent of the Richwoods R-VII School District, accepts the ‘big’ check and the real check from MRCF Chair Vicki Lange.